In 2016, total budget was $268,000. 2016 donors include the Rockefeller Brothers Fund, Foundation for Middle East Peace, Heinrich Boell Stiftung, and the Hassib J. Sabbagh Foundation. Al-Shabaka lists “Sustaining Donors” as Ali Abunimah, Noura Erakat, Sam Bahour, Rania Madi, among others. Ali Abunimah is the co-founder and executive director of Electronic Intifada, an online platform that publishes viciously anti-Israel and antisemitic articles, promoting BDS campaigns, as well as the one-state formula. Noura Erakat is the US-based Legal Advocacy Consultant for the radical Palestinian NGO BADIL. She is also a vocal anti-Israel activist; an assistant professor at George Mason University; and former legal campaigner for “US Campaign to End the Israeli Occupation,” where she “helped seed BDS campaigns” and facilitate “lawfare” cases against two former Israeli officials in US federal courts. Sam Bahour is a member of Military Court Watch’s advisory board. Rania Madi is the UN Legal Advocacy Consultant for BADIL. Al Shabaka via the Middle East Policy Network received $230,000 in 2013-2019 from the Rockefeller Brothers Fund. In May 2018, on the occasion of “70 Years of Nakba,” Al-Shabaka analysts were asked “Where Can Palestinians Go from Here?” Razi Nabulse, a researcher at Masarat, recommended “using the Nakba itself by considering it not only an anniversary, but also a destructive system and continuous manifestation of the essence of Zionism that Palestinians must dismantle” (emphasis added). Irene Calis, an anthropologist, stated that “Palestinians must recognize that the problem is not occupation, but Zionism, and proposes a collective and strategic recalibration of political action that is focused on Zionism, de-colonization, and emancipation” (emphasis added). In May 2018, during the violence on the Gaza border, Al-Shabaka published a statement condemning “Israel’s violent response” against those “risking life and limb to protest the violations of their human rights.” The statement ignored the violent nature of the protests, which included Molotov cocktails, arson, and attempts to breach the border fence with Israel. 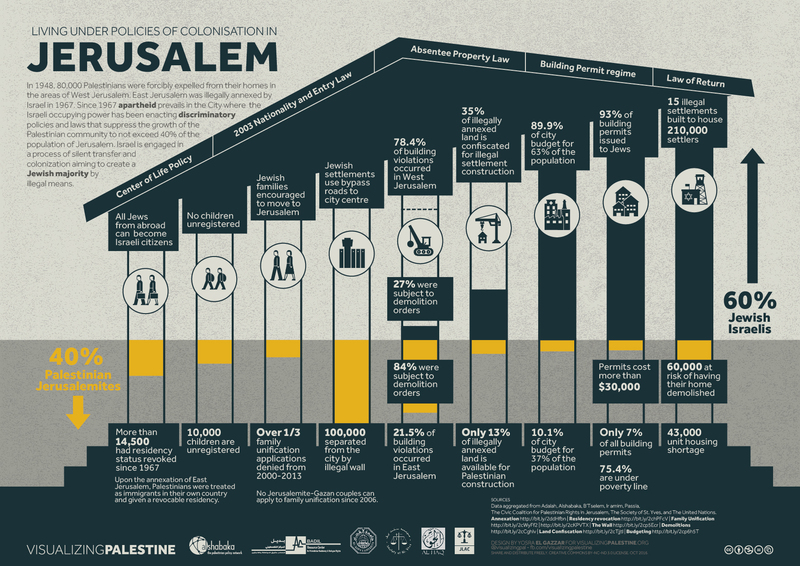 In January 2017, Al-Shabaka, with Al-Haq, Society of St. Yves, Badil, and Jerusalem Legal Aid & Human Rights Center, posted an infographic aimed at “raising awareness of Israel’s apartheid policies in the city, its effects on the Palestinian population, and the gross violations of international humanitarian and human rights law that arise.” The infographic claims that “Since 1967, apartheid prevails” and that Israel has “been enacting discriminatory policies” in Jerusalem. In 2010, Nadia Hijab wrote an op-ed in Counterpunch accusing Israel of “genocide,” and while “Israel would not directly kill tens of thousands of Palestinians…it would create the conditions for tens of thousands to die. Any epidemic could finish the job. Many of the organization’s policy advisors consistently advocate for dismantling Israel as a Jewish state. Policy advisors include: Ameer Makhoul, convicted of spying for Hezbollah; Grace Said, organized a major 2009 Sabeel conference in Washington, DC; Ali Abunimah, co-founder and executive director of Electronic Intifada; Omar Barghouti, co-founder of the Palestinian Campaign for the Academic and Cultural Boycott of Israel (PACBI); Ingrid Jaradat Gassner, founding member of the BDS Campaign and co-founder and former director of Badil; Muhammad Jaradat, co-founder of Badil; and Issam Younis of Al-Mezan and the Gaza Community Mental Health Program. The former PLO official spoke at a March 2012 “One State Conference” at Harvard University whose goal was “to educate ourselves and others about the possible contours of a one-state solution and the challenges that stand in the way of its realization.” (The conference featured other speakers tied to RBF grantees such as Dalit Baum [American Friends Service Committee-AFSC official and Who Profits founder] and Brant Rosen [official at Jewish Voice for Peace-JVP and AFSC]).